Is there an herbicide I can use on my Hostas to get rid of the weeds in the beds and around the Hostas? 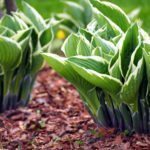 I would like to spray my Hostas to rid the area of unwanted weeds and would like to know what I can use and not harm the Hostas. A weed killer or herbicide if sprayed on or even over spray would kill your Hosta also. Pulling the weeds is the safest way to protect your plants. You could consider adding some ground cover to the plant area to help smother out the weeds. Sedums are a great addition in Zone 4.